I feel like the Midwest has reached the Official Second Tier of Chilly for the season: I can see the puffs of breath and car exhaust in the morning, we rarely leave the house without some sort of sweatshirt or coat on, and the days are brisk and mostly sunny. I’m making the most of things until Daylight Savings Time kicks in, which will signal the end of our evening walks (as it will get dark by 5 pm, a total bummer for someone who walks regularly and really loves this time of year for it) and the start of much shorter days. I know for certain that it’s soup weather: I’ve been wandering through cookbooks searching for new ones to try. As it happens, the one I wanted to try was right in front of me: at Panera Bread, of course. Seasonal soups are their jam, especially in the fall and winter. They made a particularly lovely one this year: a butternut-pumpkin thing, all creamy and orange, and it’s fantastic. They’re not beating down my door to hand over the recipe, so I thought I’d wing it and see what happened. Friends, I nailed it. And not in the “Pinterest: Nailed It” way, but in the “really, it’s delicious” way. I can’t call it a true copycat, because I substituted the pumpkin for sweet potato, because in my opinion, it’s more velvety and slightly sweeter than pumpkin. Besides, if given the choice, I’d rather work with sweet potatoes than fresh pumpkins anyway: less mess. But back to the soup: it’s got an incredibly smooth texture, a nice balance of sweetness and spice from the garam masala and cinnamon, and it’s all finished off by a nice dose of cream at the end. I think lots of recipes call for simmering chunks of squash and potato in stock: I’d rather let the natural sweetness come out by roasting them first. It brings out their flavor and adds a depth to your soup that you won’t get by simmering alone. Plus, you can do the roasting ahead of time, and when you’re ready, you only need to simmer the whole thing together for a half hour or so when you’re ready to make it. Another nice thing: no vegetable prep beyond the squash! There’s no onion, garlic, mirepoix, nothing to do. It may sound like I’m skirting around some essentials here, but i think soups like this – thick, spicy-sweet ones – benefit from not having all the extra clutter running around in there. Let the vegetable stock do the work for you: that’s what it’s there for, and you’re going for subtle here anyway. It’s a phenomenal soup for right now: everything is at the height of its season, and it’ll warm you up on those cold days and evenings which lay ahead. I’m making another batch for Halloween night, because I know it’ll be the perfect thing to come home to after freezing my randomly-costumed self off trick-or-treating through the neighborhood. Oh! And if you want a different take on a soup like this, I made a smoky sweet potato + apple soup years ago; it was one of the first recipes on the blog, and still one of my favorites. It’s a more savory one, with leek, ginger, and chipotle involved, and as it was before I branched out a bit, the sweet potatoes are simmered rather than roasted, but you could easily switch that up by roasting them ahead and then following the instructions from the simmer point on. And if you look closely, you’ll see it’s adapted from a 2011 Martha Stewart Living magazine. How appropriate considering our recent discussions here; fate has stepped in and reminded me that it was one of her successes in my kitchen. And a note about the pumpkin seeds over top: I always have raw ones in my pantry, because I use them for crunch on many things. Feel free to use the roasted and salted sort, or try making your own spiced-up roasted version from my dear Amy over at Elephant Eats: the heat from them would add a nice little kick to the finished dish. And try not to be too distracted by the incredibly awesome pumpkin she made, which is also in the zesty pumpkin seeds post; as far as I’m concerned, she won the internet with that gorgeous thing. She’s an artist, friends, and in so many ways. My own recipe, but one inspired by the Fall 2013 Vegetarian Autumn Squash soup at Panera Bread right now. If you want to test-drive this before you make it, head over there and grab a bowl. Mine has a bit more spice to it, but they are very similar. 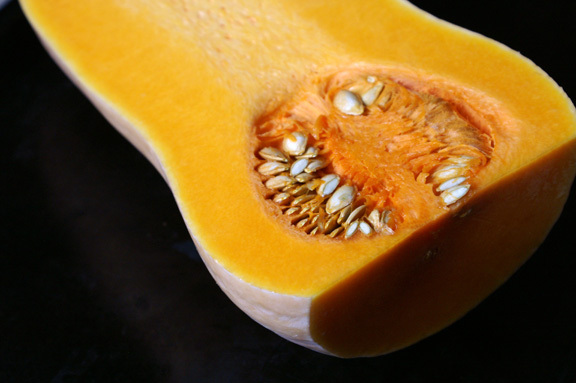 *butternut squash sizes and quality depends largely on where you are in the world, and what season it is. Autumn in the Midwest means i have butternut squash the size of small infants, but other times, they’re barely 1 pound. Weigh it out, and if you can’t find one small enough, go for broke and buy a 5-pounder, roast both halves, and save the other half for another use. Obviously a 3-pound squash won’t hurt you here, either. **because you’re not doing the whole mirepoix thing with this, it’s important to choose a vegetable stock of high quality. I like Kitchen Basics unsalted vegetable stock because it’s dark and hearty, and of course unsalted, because I like control of salt content. Please use your favorite, but if you don’t have a favorite, that’s a solid one. Using a large, sharp knife, cut the very top and bottom off the butternut squash. Stand it on its base, and slice it in half lengthwise. 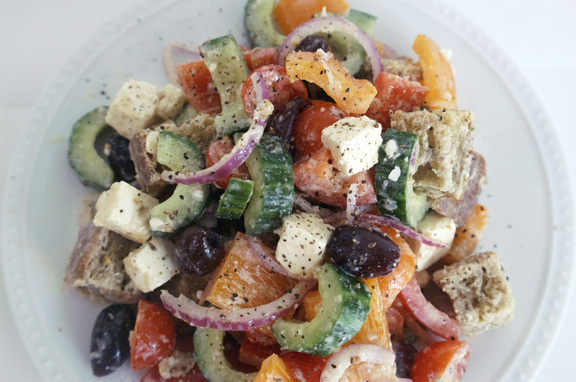 Scoop out the seeds and stringy things with a spoon, the drizzle the whole thing with a little olive oil. Place skin-sides up on the baking sheet. Poke each sweet potato with a fork about 10-12 times or so, all over each one. Place the squash in the oven on a middle rack, and place the potatoes, unwrapped, alongside the squash pan, directly on the rack. Position a rack underneath and lay a sheet of aluminum foil directly under the potatoes to catch any sugar drips. Is that dumb to do? I don’t even know if anyone does that, but I do it, because I got tired of cleaning burnt sweet potato sugar out of the bottom of my oven. also, I like to roast them directly on the rack because I feel like they roast evenly. All of that could be superstition: if you have a better way to roast sweet potatoes, use it. Roast vegetables for 1 hour, or thereabouts, until tender. The potatoes should take the entire hour: the squash, depending on size, may take less. Check it at the 30 and 45-minute marks to see how it’s doing, and remove it if need be. In a large dutch oven (or large soup pot), add the apple juice, vegetable stock, and honey. Whisk together over low heat until combined, then add the roasted squash and sweet potatoes. Using an immersion blender, whip the entire thing together until everything is lump-free and silky smooth. Alternate plan: you obviously don’t need an immersion blender for this, but I love mine and it’s a sound investment if you make soups frequently. If it’s easier for you, throw the roasted squash and sweet potatoes into the bowl of a food processor and pulse until everything is smooth, then add the puree to the liquid. Off you go. Turn the heat up to medium-high and bring to a simmer. Add the garam masala and cinnamon and season with salt and pepper to taste; remember, this is your first round of seasoning, so don’t go crazy. Adjust the heat to keep the soup simmering, and let it go for about 30 minutes. Check your soup at that point for thickness and flavor: if you think it needs more time, keep simmering in 15-minute increments until it’s the way you like it. Once the soup has reached the desired consistency, check the seasonings; add more as you see fit. Remove from the heat and stir in the vanilla and cream. 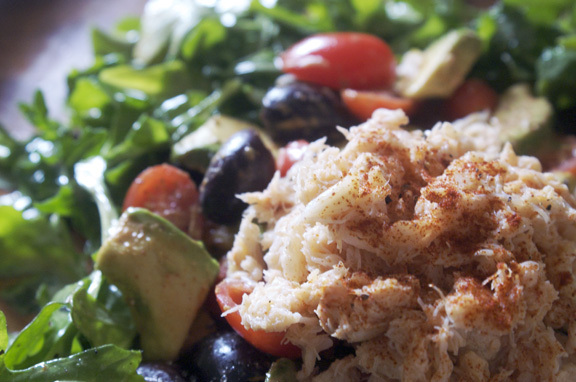 Once everything is evenly incorporated, check the seasonings again, and season according to taste. Serve immediately, scattering some pumpkin seeds over top of each bowl. 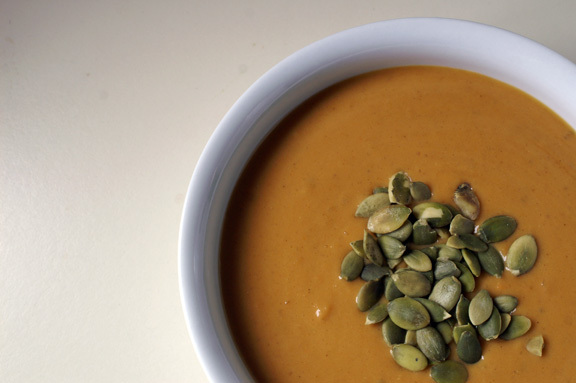 The Butternut Squash + Sweet Potato Soup is so comforting and bursting with seasonal flavor! I very much enjoy soup for dinner with a chunk of crusty bread and this is one recipe I will share with my family on a chilly fall evening. Thanks, Deb! I almost suggested a crusty bread with this; it would be perfect, and a meal in itself. I hope you love it! Loved your line from the post two years about how Martha doesn’t disappoint. Honestly, I’ve only had trouble with maybe one or two recipes out of countless dozens, and those have been found online when I believe ingredients somehow got left off. I thought you’d enjoy that: i read my old post too, and that line stood out to me. Have i grown bitter and jaded? Back then, I suppose i hadn’t tried a ton of her recipes at that point: I do remember that a few i did around that time worked really well, and i was very happy with them. I wonder if she went through a dark time with recipes after that point? or did i? SO MANY THINGS TO THINK ABOUT. you’ve got me thinking: i wonder if i should do a Martha-Off. Let all of you choose the recipes for me, i’ll make them, and we can count the success/failure rate together?? Martha Battle Royale. Let’s do this. I will totally seek soups for you. You can count on me this year for that. yay for sweet potatoes! they are ridiculously velvety, aren’t they? Other root vegetables come close, but nothing can truly match the texture. This soup looks incredible. I love the addition of vanilla in it. I have yet to use vanilla in a savory recipe, but it’s something that I’ve been wanting to try for a while now. And I love garam masala and cinnamon. So, yeah. Must try this one soon. I love soups like this, where you roast the vegetables. There’s a soup I make that has you roast everything on the oven, and then just add it to the broth and puree it, just like this one. It’s based on sweet potato and carrot, with lots of fresh ginger. I actually have not made it in over a year. I’m thinking I should make a pot of that soon, too. thank you so much! Vanilla is fun to play with in savory recipes: it’s like the opposite of what salt does in sweet recipes, because it seems to amplify the spice and give it a bit more depth. It doesn’t work with everything, but it this, it creates a nice balance. I hope you like it! Aw, Shannon, you’re so sweet for your compliments, and for pointing people in my direction 🙂 If only winning the internet was possible! This soup looks fantastic and I bet that yours is even better than Panera’s. It sounds SOOO perfect for warming up after trick-or-treating. I’m jealous that you have the Wee One as an excuse to go trick-or-treating. I can’ t wait to have kids for that reason, hehe. Plus, I’ll get to make them cute costumes like my mom used to do! What is she dressing up as?? Amy, you’re welcome: the praise is well-deserved. you’re going to win the internet someday: i say so. I’m happy you like the soup! It really is a “warm you through and through” sort of soup: thick and rich and delicious. very pumpkiny, even though there’s no pumpkin in it. Let me tell you: kids are the best excuses EVER for trick or treating. Also, carousel rides for no reason. And they can get you into local farms to see the baby animals. FOR FREE. because farm people love to see happy kids around baby animals. It’s like you have a tiny walking ticket to ALL THE FUN THINGS. my mom used to make my costumes too! I had some great ones: i was a fancy princess, and a red crayon…so many costumes. This year, she’ll be a big poofy pumpkin: she picked out the costume herself, and let me tell you how happy i am that she still wants to be something poofy and cute versus like, a sassy snowman or something. Last year she was an airplane, and the year before that, she was a lion. the year before that, she was only a few months old, so naturally, she was peas in a pod. I should dig out those photos for you and do a little montage. I WAS A BLUE CRAYON!!! done! although i may have to dig deeper for her first year halloween photo: i got all organized at some point and threw a year of her photos (and there were many thousand) onto discs for safekeeping, and removed them from my hard drive. i know where they are. Oh yeah, and this soup. I’m going to make it. And trick Aaron into eating it. I haven’t quite figured out HOW yet, but I will. As you also know, one of MY biggest sources of heartache is that i know it was close to 90 degrees there yesterday, and that’s twisted and wrong. also, i’m sad because you don’t have a Panera near you; that is ALSO wrong. TOTALLY: i’d love to be all “yeah, totally bought this sugar pumpkin and roasted it, ya’ll” but i can’t bring myself to do it 99% of the time. 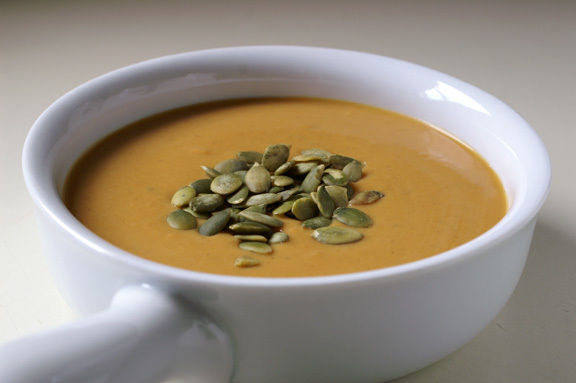 Let’s face it: the only way i roast a pumpkin and mess with the seeds that go with that is if i’m going to keep it whole and majestic, like if i was serving this soup IN that pumpkin. I love kitchen basics: i don’t get why swanson is such a big deal either. They don’t even compare in terms of flavor, and Kitchen Basics has all those varieties! DO IT: Aaron needs to expand his soup horizons. Maybe he’ll just be distracted by the orangey beauty. I so appreciate a vegetarian vegetable soup. Often I will see the name of a soup and think, “Yes! A soup everyone in my house can eat!” Then the ingredients turn out to contain chicken stock. I do often sub vegetable stock but it is better to find a recipe that is written for vegetable stock. Even better when the recipe developer can tell you the brand she prefers! I have recently started roasting vegetables before using them in soup or stew. I love the additional flavor it adds. Your savory sweet soup is just what I need when I return from a romp at the dog park (technically, Pax should be romping but I romp too to keep from freezing). Thanks, Wendy! I do as well: i think soups are nice when kept “veg-only,” because it makes them more versatile. Chicken stock is too heavily used in recipes, i agree: I wonder if it’s because it’s just easier to find a good, flavorful chicken stock versus a vegetable one? Or at least it used to be: i know lots of store-bought veg stocks taste like water, but the Kitchen Basics variety is amazingly deep and full of big flavor. I was going to say: who’s romping in that dog park? 🙂 next time, kick back with a book and let the soup warm you up. I have all of these ingredients in the pantry except for the garam masala but I am due for a trip to Penzies- good excuse to go now! And my immersion blender stopped working so I am in the market for a new one- a total must if making batches of soup in my opinion. You can’t get through soup season without an immersion blender: so much easier than a blender! definitely a must: people think it’s an extra gadget, but i use mine all the time. I made a winter squash soup for dinner last night, too. It’s the season! I agree with you on sweet potatoes vs. pumpkins: pumpkins are hit and miss, flavorwise. Sweet potatoes? Always wonderful. This is lovely – thanks so much. THIS would be my jam. I wanna, wanna, want it. REAL bad. On another note, I made my first pumpkin soup the other day. And SOMEBODY in this house did not like it…*cough*Linda*cough*…she says she only likes SWEET pumpkin things. So, I’m gonna come chill with you and we can make squashy soup things. K? *gasp* what?!?! Surely she didn’t say that. no. no, no, no. get up here: it’s probably colder here anyway: more pumpkin/squash/sweet potato appropriate. viva la squash. monica, it’s really good: we have one serving left in the fridge and i’m sad because i’m leaving town tomorrow morning, so i won’t get the last bit. 🙁 guess i’ll have to make it again! butternut squash is pretty incredible on its own, i agree: i actually made a puree with the rest of my squash from this, added a little maple syrup and a few pumpkin pie-ish spices, and i had an excellent side dish for a few days. I love the depth roasting adds to any vegetable. 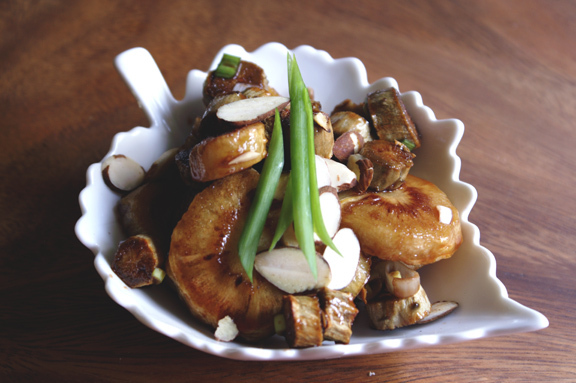 It is so much better than boiling or steaming, especially in a dish with so few ingredients. Roasty, toasty brown veggies are my favorite! And I am in love with my stick blender too. It works so well (a little too well) to make just a small amount of whipped cream. Way too easy to whip up just a little for on top of a dessert, or coffee, or hot chocolate. 🙂 Wow, how did I get from squash soup to hot chocolate?! Thanks for the soup recipe! same with me, Sarah: roasting is totally the way to go. I can’t remember the last time i boiled a vegetable: mostly i steam, roast, or something other than let all that delicious flavor seep out into water, only to be thrown away. Your soup looks fantastic and sounds even better. I must say that I haven’t been to Panera often but when I have gone I’ve always been disappointed. I must be getting the wrong thing! In any case, I’ll bet yours has way better ingredients in it! And Halloween-we always did spaghetti or chili-but a smart kid just might go for this-especially if her mom made it! Thank you Abbe! Everyone really loved it here; i’d definitely say this one goes into rotation this year. I can see being disappointed at Panera: i feel like i’m lucky they are headquartered here, because the quality control seems to be better locally than in other parts of the country? Like when i visit Nashville or Florida, it’s obviously the same menu, but maybe not done as well, if that makes sense. And i’ve noticed some variance from restaurant to restaurant, too. Mr. Table says he likes my version better because it has a bit more kick to it; more deeply spiced, i think, thanks to the garam masala with cinnamon kicker. 🙂 Not “hot” but definitely filled with warmth. Spaghetti on halloween, i like that! chili i’ve heard, but spaghetti is a new one, although it seems like a nice fit for halloween. oh. my. goodness. THAT’S RIGHT. you do not like sweet potato. second: i’ll say a hesitant “yes” to that. why? backstory on this soup: i made it knowing people were coming over. one of those people, unbeknownst to me, doesn’t like squash OR sweet potato (so, great choice by me on the soup). result: THEY HAD TWO BOWLS OF IT. and now say that they like both of those things. SOOOOO…could you be converted? perhaps. i feel like you could. i feel like you’re open to it. I feel like it’s not raisins or dates, so anything’s possible. seriously, what is with dudes and squash/sweet potatoes?? Rachael aside, ALL the instances of people not liking squash that i know of are guys. i wonder what about squash turns them off. You may get him to try this one; it does have a generous dose of garam masala, which isn’t exactly like sweet potatoes in a curry, but it IS different than that classic sweet potato/brown sugar/maple thing that most people think of. they do a great job with soups most of the time, for sure: there’s only been a small handful i haven’t liked, and i still think about their forest mushroom and their summer corn chowder all the time. I like how we have two different soups both inspired by the same thing! soup trade: i have tons of sage in the freezer, so i need to make yours next time i get squash and sweet potatoes for soup. I love fall, but I’m not looking forward to moving the clocks back. Five o’ clock is far to early for night to roll in. I hate driving home from work in the dark. This soup looks like the perfect chilly weather meal. I’ll take mine with a big ol’ hunk of crusty bread. Since i’m answering this AFTER the clocks turned back (cue “wah wah WAHHHH” music), i’ll say that yes: 5 pm IS way too early for it to be dark out. i happened to look outside yesterday around 5 and noticed that it wasn’t totally dark yet, but you know that’s only a few weeks away. this is the time of year i always hated driving home from work: you go there in the dark and you come home in the dark. GROSS. Somehow I missed this post! Dang travelling! Your recipe sounds incredible and very well-considered, with roasting the veggies first to maximize flavor. From description alone, I’d want your roasted soup over the non-roasted/simmered veg soup any day! Add in spices, cream, and crunchy pepitas and I’m yours for life (yrs 4 lyf?). Dang awesome honeymoon/vacation! always so distracting how could you miss my post on soup!! 🙂 Whenever possible, i roast veggies. Because it’s what makes them the most delicious. Now that i say that, i just thought of another soup that i could try with roasted veg….hmmmm. totally uncool: although the cold snap really made the leaves gorgeous; it’s like a painting around here recently, with all the flaming colors hanging around. I complain, but it certainly could be worse. I was just saying that on another comment: that whole work trek (when i used to do it) was the WORST when you felt like you were going home at like, 9 pm instead of 5 pm due to the intense darkness. now, since i stay home with the Wee, it cuts our days short: it just seems like we have less time to do things, when obviously we don’t, but it messes with you. I made this soup for dinner tonight, and it was IN-CRE-DI-BLE!!! Seriously. I made some ice creams last week, and had extra heavy cream. Instead of making more ice cream (which is what I would normally do), I decided I’d use some of it for this soup instead. And it was so, so worth it. I absolutely love the first picture in this post–the way the pumpkin seeds are perfectly in focus. I just want to pick one out with my fingers and eat it before it’s officially time to lift a spoon and taste the soup. The ingredients in this soup are really interesting. It’s different from other recipes I’ve seen around, which is awesome! thank you! We love this soup here; it’s a nice departure from the typical versions, and it really feels warming due to the curry and cinnamon in there. I think we’ve made it twice more since this first batch: tim takes it for lunch because it’s perfect with ham and cheese sandwiches. I’ve been looking high and low for something that came close to what Panera serves in its restaurant…and this is it! YUM-O! Betty, thank you! I loved this soup the instant Panera came out with it, so i knew i had to recreate it (as they rotate those seasonal ones and take them away after awhile.) happy you enjoyed it! martha stewart: please consider thinking before you speak [an essay].